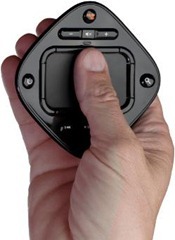 The GlideTV Navigator is a $150 wireless remote control for use with home theater PC setups. The large-ish center trackpad area is surrounded by various buttons while the outside of the remote features media, search, power, and volume controls. The remote comes with a charging station and USB receiver that works “with Windows PC, Apple Mac, Sony PlayStation 3, or any set-top box that supports standard mouse and keyboard HID devices,” though the real draw is for Windows users as special GlideTV software can be used to launch applications and web sites, as well as search various popular content providers like Hulu, Netflix, Amazon Video on Demand, YouTube, and more. Introduces the perfect input device to navigate the Internet from your TV. San Francisco, CA – October 13, 2009 – GlideTV, the company dedicated to simplifying the digital entertainment experience in the living room, announced today the release of its first product, the GlideTV® NavigatorTM. This award-winning and stylish device, which fits in the palm of a hand, combines the functionality of a keyboard, mouse and AV remote and makes it a breeze to access digital content stored on a home theater PC (HTPC) that is connected to a TV. The product is available for purchase from select online retailers worldwide with an MSRP of $149. The new GlideTV Navigator, a study in modern design, reinvents the computer input device for the living room. The contrast of the highly-polished material and elegant curves is a fitting reflection of the sophisticated technology held within. The product includes a remote, charging station, USB wireless receiver and is compatible with Windows PC, Apple Mac, Sony PlayStation 3 or any set-top box that supports standard mouse and keyboard HID devices. Consumers plug the USB wireless receiver into their PC and they’re ready to take control of their computing experience or explore the Internet with a point and a click. GlideTV Navigator works with popular media applications including Windows Media Center, Apple iTunes, Boxee, Apple Front Row, SageTV, Firefox, and any web browser. · Clickable touchpad mapped to your TV screen — precise cursor control, one-thumb scrolling, single and double-click selection. · Backlit AV buttons to control volume and playback. · Directional buttons for easy two-axis navigation. · Dedicated Esc, Enter, Back, and Function keys to control applications. · On-screen keyboard — requires download, Windows only. · Integrated search menu with links to Google, Amazon Video on Demand, Hulu, Netflix, YouTube and more — requires download, Windows only. The product has garnered significant industry attention by winning the prestigious 2009 Best of Innovations Award at the Consumer Electronics Show (CES). The GlideTV team, led by Mike Machado and Christopher Painter, consists of consumer electronics and Silicon Valley technology veterans from Sony, SageTV, Slim Devices, and VUDU. For more information, visit www.glidetv.com.